Well, I must first start off with an apology on leaving the blog behind for awhile. So much has been going on that I never got a moment to sit down and blog. I missed it. A lot! So, I am very, very sorry. With Christmas 2012 now behind me and a new year right around the corner, I have been reflecting on what a wonderful year 2012 was. Some of our 2012 highlights were: Todd graduating physical therapy at Hennepin County Medical Center with a 100% recovery from his motorcycle accident last spring, the business getting busier and busier, the birth of our beautiful niece Hadley in March, the wonderful get-togethers with our close friends and family, the "trip of a lifetime" to Alaska with Todd's family, and a wonderful holiday season! We are truly blessed. As I say goodbye to 2012, I am embracing all the wonderful things that are sure to happen in 2013. In 2013, I will say goodbye to my twenties, focus harder on my business, and spend much more time with my family. Todd and I have many plans this year... and a lot of them begin in the kitchen! Now, for a nice and light recipe to help you get back on track after a wonderful Christmas splurge. 2-3 Tablespoons good olive oil, for drizzling onto garlic. 1 tablespoon crushed red pepper, optional. 2 additional tablespoons olive oil, for marinade. Preheat your grill to high. Place garlic in the center of a piece of aluminum foil, drizzle with 2-3 tablespoons olive oil, and season with salt and pepper, to taste. Place on grill, and roast for 30-40 minutes, or until garlic is soft. Squeeze roasted garlic into a bowl. In a small saucepan, bring orange juice and 1/2 of the reserved shrimp shells to a boil and cook until the orange juice has reduced to about 3/4 cup. Strain the reduced orange juice into a blender and add the roasted garlic, crushed red pepper, and additional 2 tablespoons of olive oil and blend until smooth. Let cool completely. Place shrimp in a large baking dish, pour the orange/garlic marinade over it and toss to coat. Marinate in the refrigerator for at least 1 hour. Thread 5 shrimp onto wooden skewers, season with salt and pepper to taste and grill over high heat for 2-3 minutes per side, or until cooked through. Remove to a platter and sprinkle with chopped parsley. 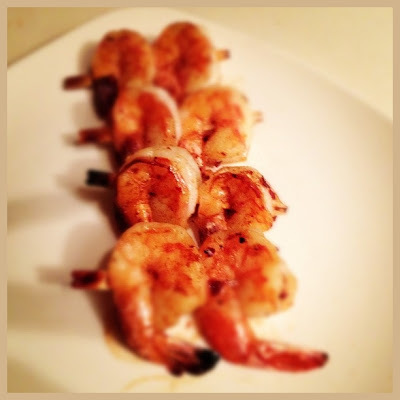 *Variation: In lieu of grilling shrimp and/or garlic, heat oven to 400°F and bake. The garlic can be prepared and baked the same amount of time and so can the shrimp! I wish you all a wonderful holiday season and a beautiful start to your new year!